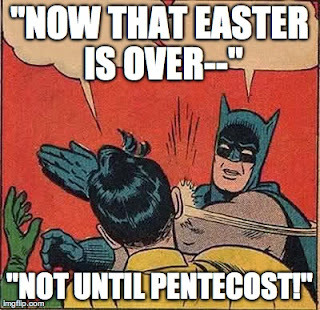 I caught myself saying it yesterday: "Now that Easter is over..." But the truth is that Easter is not over yet! Eastertide, the season of Easter that follows Easter Sunday lasts 50 days! (Ten more days than Lent!) And lasts until the Feast of the Pentecost. And why is that important? It's important because of this: the Resurrection of Jesus Christ is such a big deal, so a world-changing and life-changing event that one Sunday is not enough time to celebrate. So, the Church, in Her great wisdom, has given us fifty days to celebrate and contemplate and investigate the amazing truth that Christ is risen (the Lord is risen, indeed!). In fact, we celebrate the Resurrection more than any other act of Christ because not only do we worship God for the Resurrection all 50 days of Easter, but we also thank God for the Resurrection every Sunday (that's why we don't fast on Sundays during Lent and Advent, because every Sunday is a feast/celebration of the Resurrection). Yes, there are twelve days of Christmas and there are 50 days of Easter. What if we really spent all fifty days worshipping and meditating on this amazing truth? What new life might we experience and know as a result? Walk and Pray: Take a walk, and thank God for creating everything you see. Then take some time to think about what his new creation will look like: what will a renewed earth look like when Jesus returns? In the midst of busyness, do some listening: If you're life is very busy right now (May is crazy), then maybe read the collect for the day or the week each week. Our listen to the ESV Daily Office audio. Or take one thought about Christ's Resurrection with you throughout the day and write it down on a card and put it somewhere you'll see it. What was life-giving in Lent? Consider what Lenten disciplines you might want to make just normal life disciplines... something I'm thinking through. Don't forget to celebrate! I plan on turning some of my Lenten abstentions in reverse (e.g. eat a small dessert each night, buy some good beer), and you may want to do the same. Why not throw a party at your home?